Quickly diagnosing the OMS patient and developing the proper treatment protocol is imperative for future quality of life. Delays in diagnosis or in development of proper treatment for the OMS patient can be the difference between a wholesome life of independent living versus one of ongoing battles with cognitive impairments and dependent care requirements. The OMSLife Foundation strives to raise awareness of OMS for prompt diagnosis and also works with patients to direct them to appropriate care providers and facilities. Resource information such as our OMSLife WIKIbooks or our OMS Patient Reported Natural History Study enables doctors and caregivers to utilize additional materials to make better decisions for the patient. As more doctors become aware of OMS, the time for proper diagnosis is dramatically decreasing. 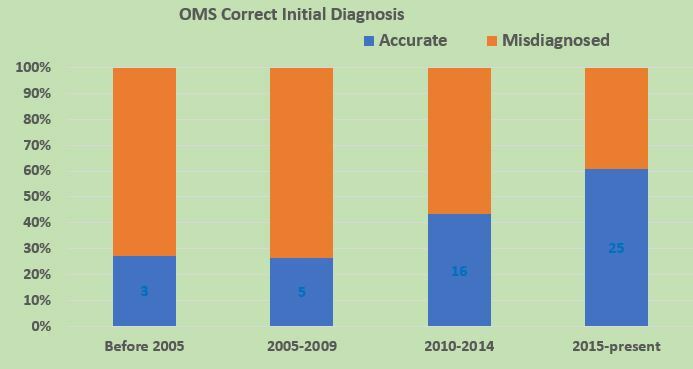 And, as the graph shows, OMS warriors have a high likelihood of an initial diagnosis being correct, as shown by the graph. This means that the OMS patient will likely encounter milder symptoms. With quick and prompt treatment, this trend also means a better outcome for the patient.